Bilateral and monolateral hand amputees suffer strong functional deficits due to their impairment. Surface Electromyography (sEMG) currently gives some control capabilities but these are limited, often not natural and usually require long training times. First, the effects of the amputation on the nervous system of the subjects are not fully clear; second, there is a strong lack of accuracy in movement classification and a few wrong movements can have important negative effects. 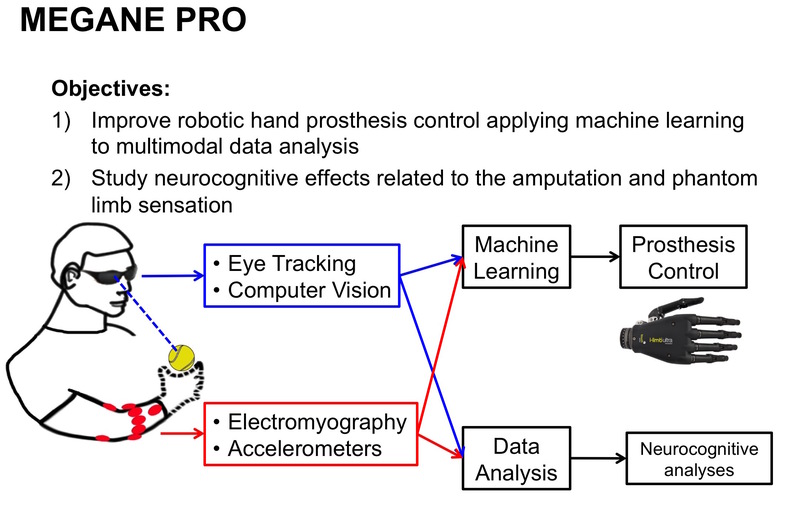 With the NINAPRO project, we started to improve this situation through the establishment of a standard benchmark database of sEMG data for hand movements, which was welcomed with enthusiasm by the scientific community. With MEGANE PRO, we aim to bring the research in this field to its next step, i.e. to better understand the neurologic and neurocognitive effects of amputation on the persons and to strongly improve robotic prosthesis control possibilities by hand amputated subjects.